The complete name of this Disney/Kellogg's cereal is Hannah Montana Multi-Grain Secret Identity Cereal. It consists of red, purple and reddish purple cereal pieces. This is a fruity cereal. I don't mean that in any kind of an off-color way. It's filled with berry flavor, mainly strawberry. It's not a great cereal, but it's better than most novelty cereals. High School Musical Cereal tasted like a whole lot of nothing. Frosted Krusty-O's Cereal (The Simpsons) tasted like the generic version of an off-brand shoe. This cereal tastes alright. The nearest flavor comparison I could draw is Cap'n Crunch's Crunch Berries. Hannah Montana is sweet. I'm talking about the cereal. The sugar content is not totally horrible at 9 grams per serving. The aspect I liked least about this cereal is that the sugary berry flavor yields to a corny (as in corn) flavor after the cereal has been chewed. Those two flavors tend to compete for attention instead of uniting to create a single flavor. In the end, I'm going to recommend this cereal... to Hannah Montana fans and cereal box collectors. If you just want a nice berry flavored breakfast cereal, there are many better options. Nutritional Considerations: Each 1 cup serving of Hannah Montana has 110 calories, 1 gram of total fat (0 grams saturated and 0 grams trans), 0 mg cholesterol, 25 grams total carbs, 1 gram dietary fiber, 9 grams sugars and 2 grams protein. 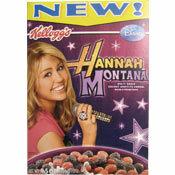 What do you think of Hannah Montana Cereal? Hannah Montana is sweet :) But her cereal was too sweet. This is one of the best cereals I've ever tasted! I wasn't expecting it to be good. No other look mom cereal is. Disney Princess cereal was the nastiest cereal I ever tried to eat. This one was so good I bought it for myself also. I'm not a big cereal eater. I think it's odd grown adults knock thing they don't try based on a picture and name of a girl that they don't agree with. Grow up. 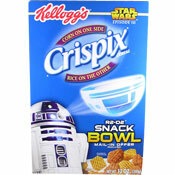 This was Kellogg's only excellent cereal! I wouldn't feed this to Billy Ray Cyrus.